Roughly three weeks after Tapbots' Mark Jardine teased the existence of a Mac version of the popular iOS Twitter client Tweetbot, the application has now launched to the public. But rather than coming as a final release, Tapbots notes in a blog post that it is initially arriving as a public alpha. We’ve decided to release it as a public alpha to a) motivate us to finish faster, and b) get feedback to help us build the best Mac incarnation of Tweetbot we can make. You can love it or hate it, but rest assured it will only get much much better from here. Tapbots has not yet decided on pricing for the final release version of Tweetbot for Mac, but should "think of [the public alpha] as a long term trial" available free of charge. The final version will be available via the Mac App Store. The early public alpha will undoubtedly contain a number of bugs and comes with no official support, but users are encouraged to download the application and submit feedback to help fix and improve the software. Some features such as Notification Center and iCloud sync support do not function in the public alpha due to Apple restricting such features to Mac App Store apps, but they will be included in the final shipping version. 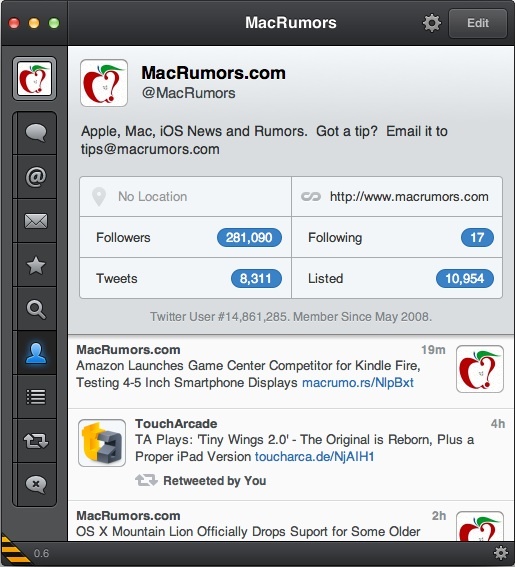 Tweetbot gained a loyal following with its iPhone app [App Store], released in April of last year. Tweetbot made the jump to the larger screen with the launch of an iPad version [App Store] in February of this year. Each of the iOS apps is priced at $2.99. Does anybody else love that icon? :) It also wobbles like an egg about to hatch when you visit the download page. sure, it's an "alpha" release but that UI is disgusting. even twitter for mac is far superior in UI design. I hope this is only the alpha UI - it looks very fugly and rushed. Just like Apple's own Notes and Reminders apps? Apple hasn't cared about their guidelines in quite a while. Yeah, I'm really hoping this gets sorted for the final release. Can't see how it can possibly need the discrete card. yes! I thought I was the only 1 that thought this. Its missing the chance to use a custom short URL service and a custom image hosting service. Its a shame as for me this the best feature of Tweetbot. If I tweet a photo I want it to be hosted on my own site so I'm driving traffic to my site and not to a 3rd party - and I have short URL services for my two main Twitter accounts. I realise these are advanced options and probably no one else on the forum will use them, but there isn't another Mac twitter app that lets you specify custom URL and custom image hosting api's on a PER ACCOUNT basis. Its annoying that I have to switch to an iOS device to tweet things easily this way.